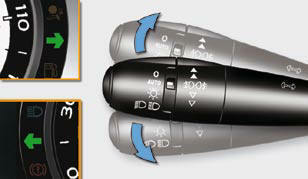 Selection of the left or right direction indicators to signal a change of direction of the vehicle. Lower the lighting stalk fully when moving to the left. Raise the lighting stalk fully when moving to the right. System for indicating a change of lane on a motorway. Move the lighting stalk briefl y upwards or downwards, without going beyond the resistance point; the direction indicators will fl ash 3 times. This function can be used at any speed, but it is particularly useful when changing lane on high-speed roads. Hazard warning lamps A visual warning by means of the direction indicators to alert other road users to a vehicle breakdown, towing or accident. Press the button A , the direction indicators fl ash. 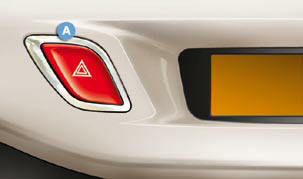 When braking in an emergency, depending on the deceleration, the hazard warning lamps come on. They will switch off automatically the fi rst time you accelerate. If they do not, press button A to switch the direction indicators off. As a safety precaution in a traffi c jam, switch on the hazard warning lamps if you are the last in the queue.